Two Military Daughters Start Sisterhood For Teens Two teenage girls from California are trying to organize a statewide get-together for daughters of troops who have gone to war. Moranda Hern and Kaylei Deakin have put up videos on YouTube and appealed for help from the National Guard in Sacramento. 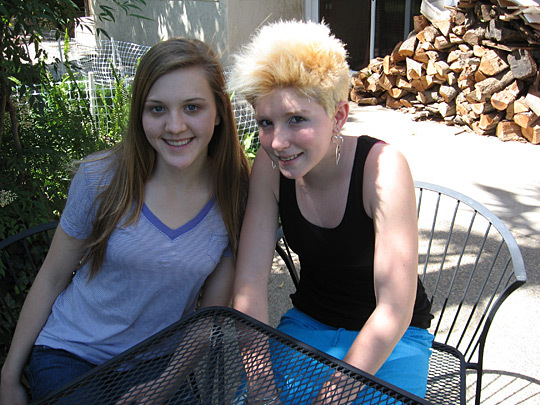 Teenagers Moranda Hern (left) and Kaylei Deakin are trying to organize the first major get-together for daughters of troops who have gone to war. On the Internet, there are all kinds of videos of teenagers being teenagers. Some are breathing helium and then talking like Donald Duck. Others are squealing because they got asked on a date. There are endless variations of kids getting grossed out by pimples. But a recent posting on YouTube.com is different. "I'm Moranda Hern, and I'm a military teen," says a young woman who looks like a cheerleader. "I'm Kaylei Deakin," her friend says, wearing a bright blond mohawk. "I'm 16, and I'm also a California military teen." The girls look straight into the camera, and sound proud. "During my dad's deployment, it was a really tough time for my family," Hern continues. "And the more we identified with other military youth from across California, we saw they had the same need." The high school girls, who will start their senior year in the fall, have decided to do something that nobody has done before — not Pentagon officials, not governors, not mayors (at least, NPR can't find a record of it). They are trying to organize the first major get-together for the children, specifically daughters, of troops who have gone to war. "We'd like to boost these girls and their self-esteem and their self-confidence," Deakin tells the camera. "We are growing the sisterhood, with our mantra: unite, inspire, lead," Hern adds. They call their conference "The Sisterhood of the Traveling BDUs" — a play on the title of a popular novel and Army speak for battle uniforms. The story of the girls' crusade is a reminder that since the U.S. and its allies invaded Iraq and Afghanistan, the public has heard a lot of stories about troops and the toll the wars have taken on them — but the nation has seldom heard their children's perspectives. The teenagers have caught the attention of Brig. Gen. Mary Kight, the No. 2 commander in California's National Guard, who says she's determined to help them organize their conference. Hern and Deakin say their idea was inspired by the misery they felt after their fathers, both members of the National Guard, went to Afghanistan. For instance, they say their friends basically deserted them. "I was like a social pariah because my dad was gone, and they didn't know how to handle it," Hern says, sitting in her family's backyard near Fresno. Therapists who work with military children say this is a common problem, especially for kids like Hern and Deakin, whose fathers are working in the National Guard instead of in the Army, say, or the Marines. If their fathers lived on military bases, all the other children in the area would share the same problems. But National Guard troops are scattered around the community. Hern says none of her friends had military parents, so they didn't know how to react when her dad went to war. "They wouldn't call me; they wouldn't return my calls," she says. "They wouldn't come over, see how I was doing." She says she finally asked one of her friends why she had turned away, and the girl explained, "I just don't know how to act around you. It's uncomfortable for me. So I don't even want to be around you." Hern says she and her mother became almost reclusive, like hermits, spending months glued to the TV, eating only one meal a day. Her mother, Molinda, confirms it. At the time, Hern and Deakin didn't know each other, but Deakin's family's life was turning upside down, too. When her own dad, Maj. Lorren Deakin, went to Afghanistan with the 576th Engineer Battalion, her grades plunged from A's to C's and even an F.
"My confidence dropped," she says. She stopped practicing flute and French horn, which she had loved, and stopped showing up at extracurricular events. Meanwhile, Deakin's mother, Doreen, was struggling with her own emotional crisis after her husband went to the war — and the daughter started taking over some of her mother's usual role, including watching over her two younger sisters. "When the girls were misbehaving and we had guests over, I would discipline them, because my mom would just sit there," Deakin says. Her mother confirms it. "It was kind of embarrassing to me because my family's always been a strict family," the daughter says. Deakin says she and her mother became so stressed that they started getting into physical fights. As she tells the story of how she begged her mother to organize a family Thanksgiving, and how her mother seemed disinterested, she starts sobbing. When their fathers came home, the girls say, things got even tougher — at first. Everybody had fantasized that the day their fathers stepped off the plane, everything would be OK again — their homes would be bursting with joy and love. But reality was different. One says her father was edgy and distant. The other says her father bossed her around like a soldier. And that's when Hern and Deakin met each other and knew they were soul mates. "I mean, we only knew each other for like a day, and we were finishing each other's sentences," Hern laughs. They were attending a conference sponsored by Maria Shriver, the TV personality and Gov. Arnold Schwarzenegger's wife, aimed at inspiring young women to follow their dreams. Afterward, Hern was on a bumpy flight home when suddenly she had a dream. She and Deakin should organize their own conference, to inspire and support military daughters. They started tossing around ideas, in late-night phone calls and countless texts. Soon, they hammered out a detailed blueprint in PowerPoint form — and then asked to present it to Brig. Gen. Kight at the National Guard headquarters in Sacramento. Today, Kight remembers trying to contain her emotions as the 16-year-olds stood in front of a screen in the National Guard conference room and laid out their ideas. "I just wanted to run up and hug them, they had so much to say," Kight says. Deakin and Hern had thought of just about every detail. They had already booked a conference center. They proposed to transport girls there from up and down the state, partly using military buses and aircraft. They had scheduled early morning workshops on self-esteem and late-night pajama parties to build trust. They had a list of possible speakers. "They reminded me that anything is possible," Kight says. "I know that I wasn't thinking like they were at that age. Because they are reaching for the sky." And Kight says she and her fellow commanders want to help them grasp it. Hern and Deakin are now planning to contact corporations such as Google, Disney and TOMS Shoes to raise money. And Kight says she and fellow commanders are mulling over ways in which the National Guard could help make the conference happen. Hern and Deakin say they worry sometimes that none of these dreams will come true. But those moments pass quickly, and they feel confident again. "There's really no reason not to," Deakin says. "Me and Moranda have the willpower, and whatever we can do, we'll make it done." "Like, there were, especially in the beginning, people who thought this program was too big, too far-fetched," Hern adds. "So if we didn't believe fully and convince everyone — and ourselves — that it was going to happen, then it wouldn't happen." Kight says there's just one issue where she and the young women might disagree as they work toward staging their conference next year. Kight says boys whose parents have gone to war need help with their self-esteem, too. She wonders whether Hern and Deakin might be willing to make their conference coed.